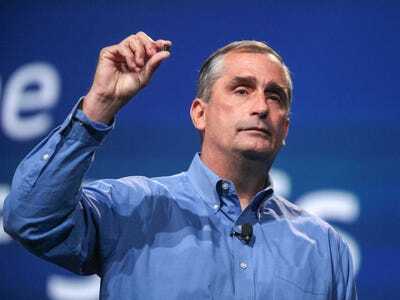 At its annual investor meeting on Thursday, Intel CEO Brian Krzanich said he’s not ashamed of the his mobile unit’s losses, and explained why he thinks the merger between the PC and mobile chip units will help improve its mobile sales. “It’s not that we’re proud of it, but we’re not ashamed of it, either,” Krzanich said in reference to the billions of dollars in losses his mobile and communications group has been seeing this year. Intel’s mobile and communications group lost more than $US1 billion in in the third quarter alone, while sales dropped to a mere $US1 million from $US353 million a year ago. Overall, the unit has lost $US3.1 billion on only $US209 million in revenues in 2014. The group was originally created in 2011. He admitted that Intel has been late to the mobile business, saying its mobile products and strategy were “fairly absent” from it. “When you come into a market that’s that far along in its maturity curve, you’ve got to go and get your way in,” he said. But Krzanich pointed out that Intel has been making good progress lately, rolling out products at a faster rate. For example, Intel is on track to get its chips in more than 40 million tablets this year, and is also establishing its presence in the Chinese market through partnerships with local brands like Rockchip, Asus, and Lenovo. Krzanich said the merge between its PC and mobile chip groups announced this week will only help drive its mobile sales growth. Through the reorganization, Intel will have a single unified gruop for the entire chip production process, from engineering and architecture to sales and marketing. Plus, since a lot of Intel’s customers come from the same company – think Samsung, who sells mobile, tablets, and even IoT products – it will only simplify the whole communication process. “What this reorganization does is it allows us to provide one organisation from top to bottom. So within the same organisation, no walls, no separation of leadership, it’s one organisation now,” Krzanich said. Earlier this week, The Wall Street Journal reported that Intel would combine its PC and mobile teams under a new unit called the client-computing group. Kirk Skaugen, a senior VP who now leads the PC-client group, will be in charge of the group. The organizational change will become effective in early 2015.